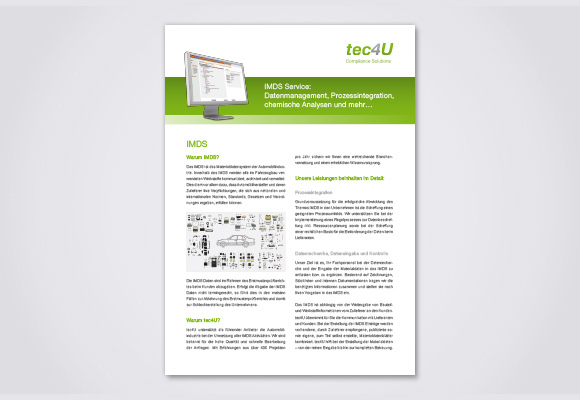 Is your IMDS implementation really economical? IMDS is the automotive industry’s material data system. Today, the system is an integral part of a product’s first article inspection and a regulatory requirement that applies to the entire supply chain. All materials used in vehicle manufacturing are archived and managed in the IMDS. This enables automobile manufacturers and their suppliers to document and report compliance with their obligations under national and international norms, standards, laws and regulations throughout the entire supply chain. analysis of basic materials and components to identify missing material data. 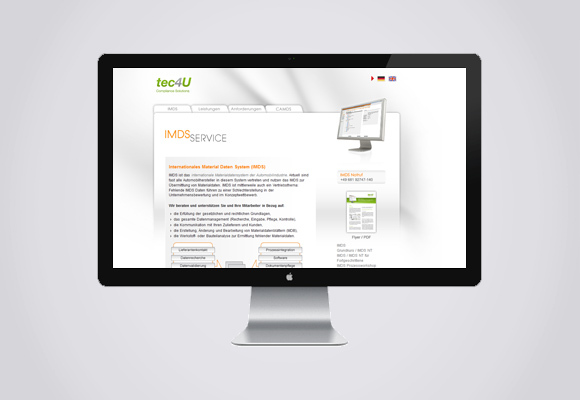 tec4U-Solutions handles more than 400 IMDS projects each year, meaning that you can benefit from our extensive industry connections as well as a significant competitive advantage in terms of expertise. our acknowledged high level of quality in the work we do with manufacturers.